There are lots of different reasons why parents need childcare for their children. For some it facilitates a return to work, training or education while others may simply want to see their child enjoy the socialisation and developmental benefits of quality childcare. No matter what the reason is, the important thing is to choose a childcare option that you are completely happy with and that is going to facilitate the individual needs for both you and your child. This section of the website is designed to explain the different types of childcare available and assist you in making an informed choice that suits both you and your child. Choosing quality childcare is an important decision therefore it is important to take your time researching the different options available to you. Get references or recommendations from other parents, friends or co-workers. Develop a list of potential childcare options and make contact as soon as possibility. A centre based facility is ideal for you if you want your child to mix and socialise with similar-aged children in an environment that is centred on early childhood care and education. 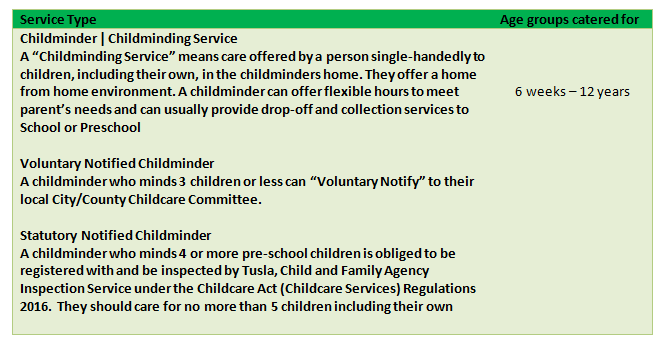 Whether private or community based, they must be registered and inspected by Tusla, Child and Family Agency Inspection Service under the Childcare Act (Childcare Services) Regulations 2016. A home based service is ideal for you if you want your children to be cared for in a home environment where they can socialise with small groups of children from varying age groups. Home-based childcare can also provide structured educational play and learning. Síolta, The National Quality Framework for Early Childhood Education, is a set of national quality standards for early childhood care and education. It is intended to provide support and guidance for all those working with, and on behalf of, children. As a parent, you have a key role in this process, as nobody knows your child, their abilities and their needs, better than you do. It is designed specifically within an Irish context and for use within all ECCE services regardless of curriculum or approach (for example Childminding, Montessori or Play based approaches). 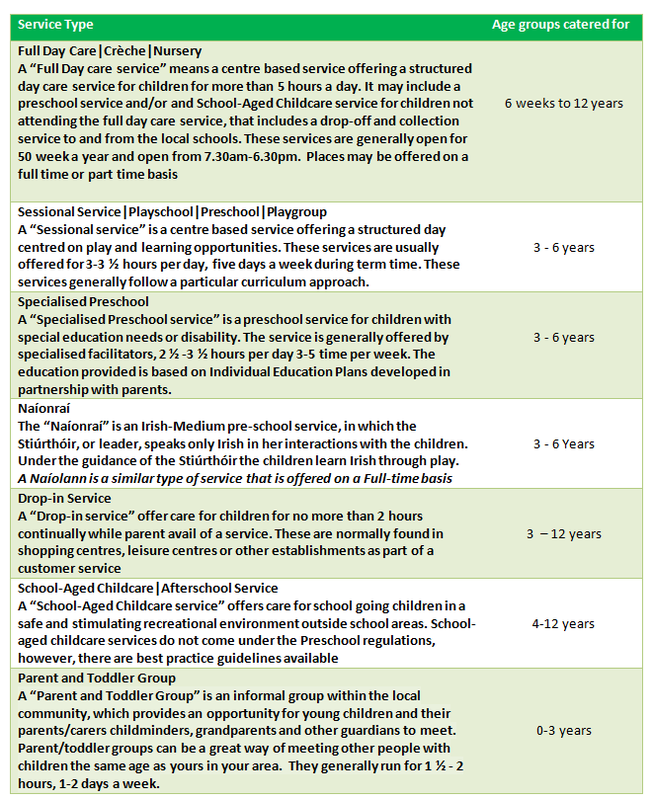 All services offering the Free Preschool Year (ECCE) have agreed to adhere to the standards and principles of Síolta. Have they completed and been assessed under the Síolta Quality Awareness Programme? Does your child’s setting have the Síolta materials available? Can they discuss how they meet the Standards for quality?